Harvard College Student Blog · Can it really be this Nice? Can it really be this Nice? I can’t believe it, I’ve been in Paris for 4 weeks already! I’m halfway through my Study Abroad program, which you can check out here; it’s wonderful, and the weather has finally brightened up in time for Paris Plages, where the city creates artificial beaches along the banks of the Seine. 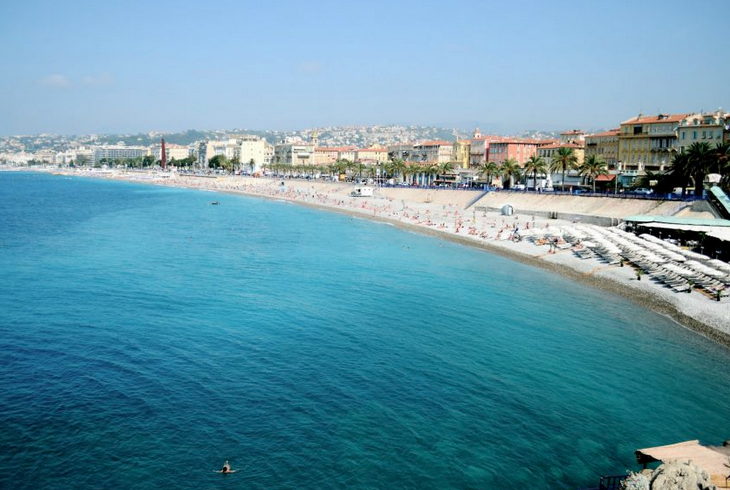 However, Paris has nothing on Nice when it comes to the beach…I would know, as I just returned from my amazing weekend in the South of France. As a bit of an update, here are some stories and pictures of one of the best weekends in my life. 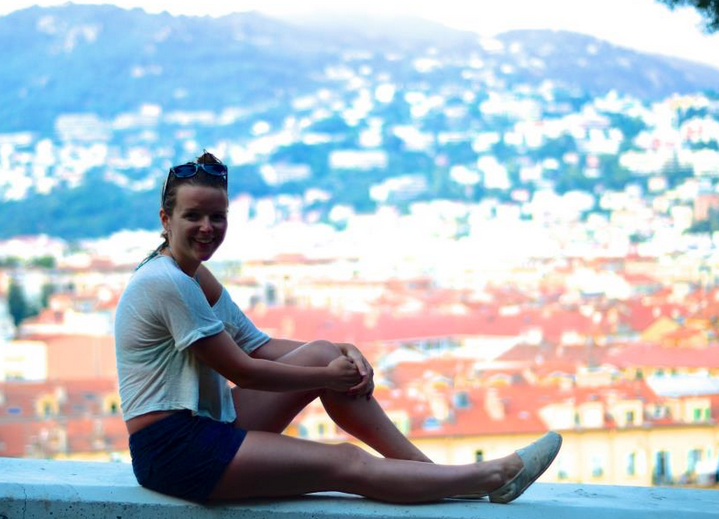 My friend Anneli and I had decided a while ago that we wanted to go to the south of France, and chose Nice because her host family knew some people there with whom we could stay. The tickets were cheap (EasyJet) and the plane didn’t even remotely crash during our 1h10 flight, which left around 9pm from Orly. 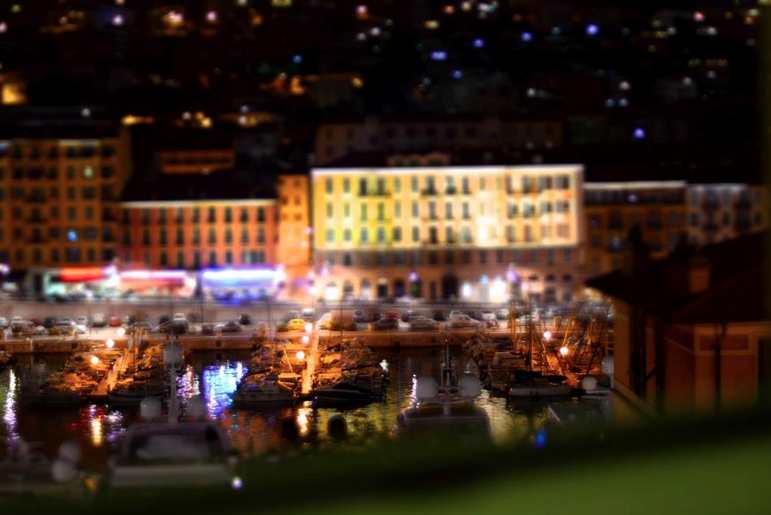 Nice by night is oh so much like California, along le Promenade d’Anglais with all the lights, palm trees, and new-ish hôtels lining the beach. Rollerbladers and cyclists oozed down their lane of the promenade, passing piétons as they strolled in the light of the humming lampposts. The air was warm and thicker than Paris, whose air is crisp and spoiled with pockets of cigarette smoke or exhaust. Our view from our room, above the bed (we thought we were going to sleep on the ground) and through the shuttered windows, breathed out onto the bay, which was lit by the colorful night hues, illuminating the neat lines and sailboats below. Panicky joy ensued. In the morning, we packed our daybags and walked out into Vielle Nice. My, how lovely it is. Imagine the streets of Boston, or of Paris. Not of New York, erase all of those grids from your mind. Now, cut each block in half with a road. And another, at a different angle. Sprinkle dead end alleyways where you wish. Alternatively, imagine the most rustic Italian quarter with burnt orange walls, which meander up towards terracotta roofs as they slide into open windows, flaking blue shutters thrown wide, inviting in an even brighter azure sky. The roads cut sharply at acute angles, creating houses as skinny as a cabinet that widen out to twenty times that size. Around the corner is a baby-pink church, its belltower peeking out over the surrounding buildings, as if it wished to glimpse the sea that it heard so often. The smell of bread and oregano wafts through an open window. And, somewhere, a thousand tourists fall in love with a city for the first time in their lives. The majority of them can be found on the beach, where we happened to spend most of our day. It is incredibly crowded, incredibly sunny, and incredibly beautiful. Les cailloux are smooth, grey, and warm, not scalding like sand, nor are they as comfortable as their counterpart. They become smaller as they reach towards the water, where they dip, and rise, and dip again before plunging into the sea. It is deep almost immediately, a light salty blue closer to the shore and a brighter hue further out. The perfect temperature, it stretches on forever, embraced by Nice Côte d’Azur airport on one side and la colline, a fortressed hill, on the other. Nice-ville stretches in between, connected by the Promenade. After buying strawberries from an old lady who closely resembled a dandelion, and ice cream from a dim man on the street, Anneli and I walked back to the sea. I slurped up the fast-melting passionfruit scoop, took a lick of coffee, and finished by dipping my strawberries into the rich dark chocolate of my final scoop— and all for 4€. The sun was strong; we bought some sunscreen from a para-pharmacie. Eventually, we figured out how to use the VéloBlue, and spent the next two hours biking around, returning the creaky blue bikes to their stations before the 30 minutes were up and re-renting them to avoid any charge at all. After biking all the way to the airport, we decided that we’d bike to catch our flight at 5 am. Only then did I realize how burned I was, and after another swim in the evening with bronzed Russian children, we rinsed in the beach showers and returned back home to change, taking the long route via climbing the stairs of the fortified hill and weaving through the paths up there. It was silent, and for around 3 minutes I heard nothing but nature, something we both needed dearly. We gazed out at this marvelous town, thanking Harvard for all of the gifts it’s given us. We finished our first day with smiles plastered onto our faces, and on Saturday evening we decided to splurge on some dinner. 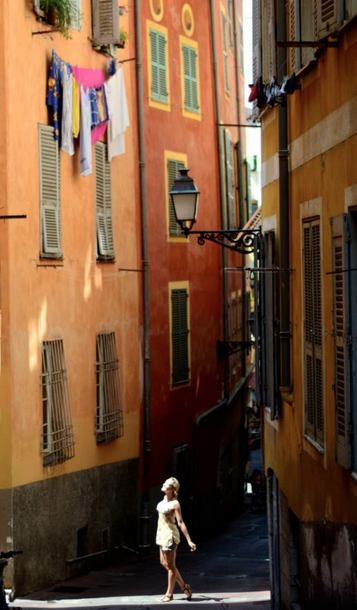 Walking around Nice with the fantastic light charmed us until we returned to Place Girabaldi, where a restaurant with the same name awaited us. The catch? It had fresh pasta. Anneli ordered pesto gnocchi, and I ordered black truffle risotto. Both came with parmesan. Our waiter was terribly bizarre, but the food was phenomenal. 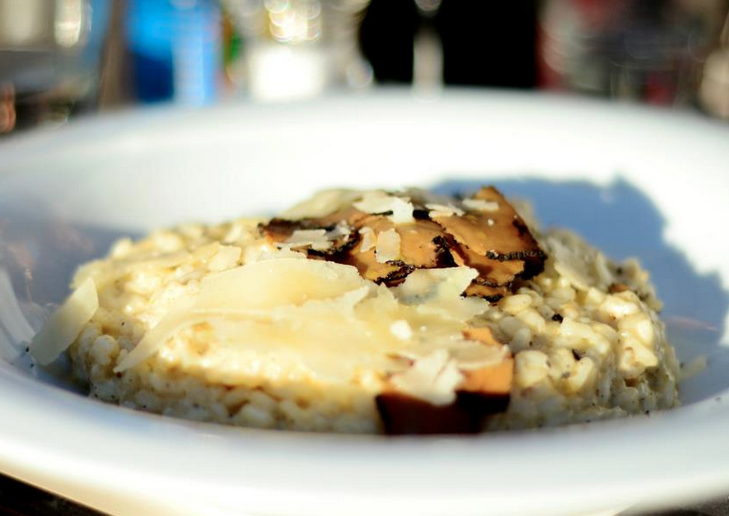 I mourned the half of the risotto that I couldn’t eat, knowing that now, as I write this, I would be (and am) craving the delicious earthy flavor and richness of that plate. After eating, Anneli realized that all of the tables around us were full of Swedish people. She is Swedish, after all, and so a lengthy discussion with the portly man and his wife next to us ensued. I loved listening to it, but found myself automatically wanting to speak Italian afterwards, as Swedish is about as sing-songy as the other language I know, and is very different from French. It was hilarious to hear, and we eventually left after Anneli had had her heritage-full, spending the rest of the night on the beach in between tight circles of boys and night-fishermen, who actually caught fish in the warm Mediterranean. Have a lovely summer, and incoming Freshmen, get excited!!! Harvard is the BEST! I’d like to talk to you about an idea I have for a story on your blog. If you could get in touch that would be great. I like your post 🙂 I can understand your the excitement. Always it’s good that see new places, meet new people. And also Mediterranean countries they’re lovely. Friendly people, beatifull nature and weather is excellent. I visited Italy too and I love this country despite of I live in Turkey that is a mediterranean country. I didn’t visit France but as soon as possible I want to visit it. Especially Paris. You’re lucky , you saw that places. I think, if you understand soul of Mediterranean you should visit Spain, Greek and Turkey. I’m sure that it’ll be great. Take care..